Dashing Sashay, under jockey Jorge Linares, wins the French Quarter Stakes at the Fair Grounds Race Course on Saturday. 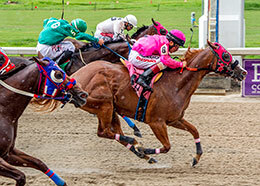 © Hodges Photography/ Lou Hodges, Jr.
NEW ORLEANS, LA—SEPTEMBER 8, 2018—Dashing Shashay got a clean trip under jockey Jorge Linares to defeat stablemate and post time favorite Graceful Eagle by a neck in the $35,000 French Quarter Stakes Saturday afternoon at Fair Grounds Race Course & Slots. Graded stakes winner Memphis D Nasty finished a nose back in the blanket finish to get third. Trainer Josue Huitron saddled Dashing Shashay to her first career stakes win in Saturday's French Quarter. The daughter of world champion and champion sire One Dashing Eagle completed the 330 yards in :16.671 seconds, a 96 speed index under a showery sky and into a 3 mph crosswind. It was the fifth win in 11 starts for the SF Racing & Enterprises LLC-owned filly. Bred in Oklahoma by Monty McNair, Dashing Shashay picked up $15,000 to boost her earnings total to $62,205. The sorrel filly was fourth in the Grade 3 Oklahoma Derby and fourth the Easy Date Stakes at Remington Park last Spring. Coming off a win in the Simulcast Services Stakes in her last start, the Grade 1-placed Graceful Eagle was sandwiched at the start under jockey Luis Vivanco. The Florentino Leon owned daughter of champion/champion sire One Famous Eagle picked up $5,000 for her effort to increase her earnings total to $198,343. Thomas Bradbury bred the bay filly in Colorado from the Corona Cartel mare Duplicate Check. Making her first start since July, graded stakes winner Memphis D Nasty earned $2,750 for third. Bruce Bell conditions the FDD Dynasty filly for owner Adame Racing LLC. Bred in Arizona, by Giambi Stables LLC, the 5-year-old bay mare was ridden by leading rider John Hamilton. Out of the Corona Cartel mare Jess A Cartel, she has earned $143,173. Zenergetic, Non Stop Patriot, Tk Zooomaway, Hr Chatter Wagon and Ttt Kas completed the field. Jess Political and La Mos Corona were both scratched.